Fly through the city. Smash the villains. Backstab your teammates and grab their gadgets. Munchkin has parodied the classic dungeon, the kung-fu warrior, the space epic, and the creatures of the night. Now it's the superheroes' turn! Be a Mutant, an Exotic, a Mystic, or a Techno. The higher your Level, the more Powers you can have. Battle dastardly masterminds, devastating monsters, and invading aliens from the next dimension -- from the wimpy Bucketman all the way up to Big Ol' Planet Eater Guy himself -- and TAKE THEIR STUFF! With the Electro-Mento-Hat, the Telezapinator, and the (jet-powered) Pogo Stick, no foe can stand before you! 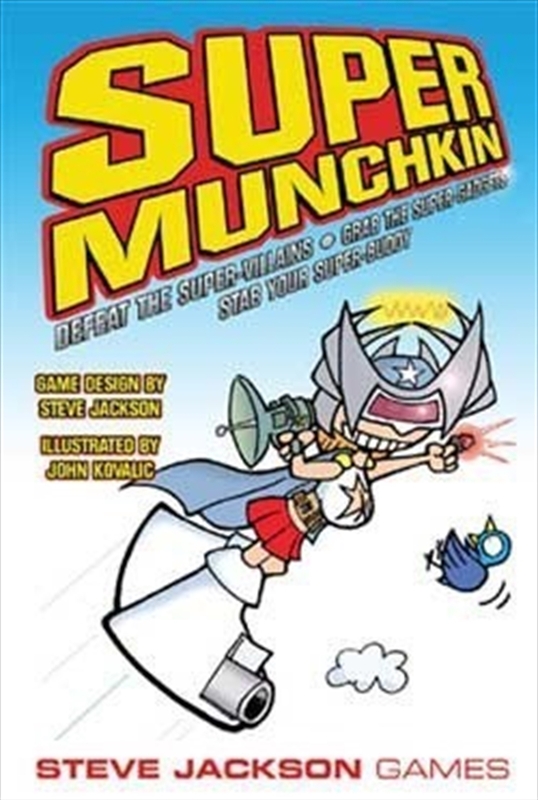 Super Munchkin is a stand-alone game, which (of course) can be combined with other Munchkin games. Designed by Steve Jackson and illustrated by John Kovalic, this one is destined to RULE THE WORLD! Mwahahaha! Boxed game with 168 cards, rules, and die.